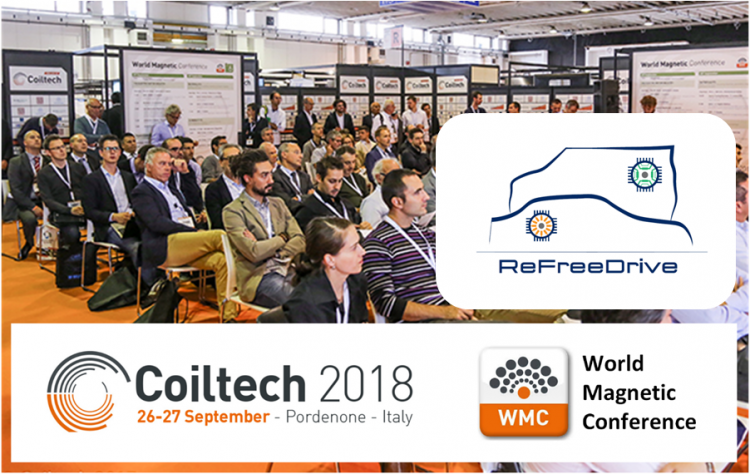 As we have informed before, ReFreeDrive held its own dissemination session as part of the Coiltech international exhibition, taking part actively on the World Magnetic Conference, which is chaired by Professor Marco Villani, from the University of L’Aquila, Dissemination Leader of this project. Colitech World Magnetic Conference 2018, ReFreeDrive Project Presentation, Fundación CIDAUT, B. Araujo. You will find there a general overview of the project, who are the consortium partners, and what their main tasks, as well as the objectives and KPIs of the project. Colitech World Magnetic Conference 2018, Copper Use in e-Mobility, European Copper Institute, F. Nuño. This papers reflects on the opportunities posed by copper alloys in the e-Mobility, delving into the market evolution and material availability in the future. Colitech World Magnetic Conference 2018, Synchronous Reluctance Motor for Traction Applications University of L’Aquila, M. Villani. Pure synchronous reluctance motors have no magnets, no rare earth and materials with no supply issues and are a very promising technology for the future. Here you can find the first steps towards our motor design. Colitech World Magnetic Conference 2018, Rare earth free PM Assisted Synchronous Reluctance Motor for Electric Vehicles, IFP Energies Nouvelles, B. Gaussens. Permanent magnet assisted motors are the second branch researched in Synchronous Reluctance. This presentation shows the preliminary design concepts we are working with. Colitech World Magnetic Conference 2018, Adoption of the Induction Motor with Copper Rotor for e-Mobility; Motor Design Limited, N. Riviére. The induction motor is the second technology featured in this project. Led by Motor Design, this presentation focuses on the first design alternatives and results obtained so far. Colitech World Magnetic Conference 2018, Evaluating Electrical Steels for Electric Vehicles, Rina CSM, S. Cicalé, S. Notargiacomo. Common to both alternatives, a material characterization of different electrical steels has been performed within the ReFreeDrive project. This presentation discusses material properties and their influence on electric motor performance. Do not hesitate to give us feedback with your impressions or questions!